On Wednesday 29th April 2015 the School of Law hosted the second round of the UH/Blackstone’s National Criminal Advocacy Competition against the University of Leicester. 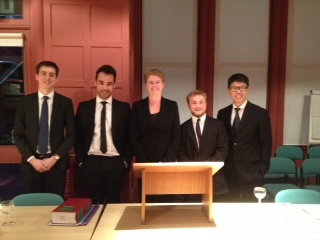 Finalist Mark Jenkins and first year student David Tan acted as prosecutors examining and cross-examining the complainant (marvelously played by first year student Ruth Cottington-Bray) and defendant (exquisitely played by Dr Nicholas Roberts) in the case of R v Webber against the defence team (final year students Sefki Bayram and Robert Quartly). Judge Johannah Cutts QC of Reading Crown Court decided the case and provided detailed feedback to the competitors on their individual performances. As the competition is based on a calculation of scores, rather than a knock-out basis, we will find out in due course whether Mark and David have made it through to the semi-final round. This entry was posted in Competitions, Events, Mooting, News. Bookmark the permalink.